The Romainville residential complex and the La Plaine high school are two of the most recent projects carried out by studio Brenac & Gonzalez & Associés. These two projects are very different from one another, due to their functions: the first one is a 161-flat residential project, and the second one is a high-school. Realised in two different French cities, these two projects share a common characteristic: they both play an important role in the transformation and redevelopment of the urban context in which they were built, and offer interesting solutions to contemporary urban and environmental challenges. 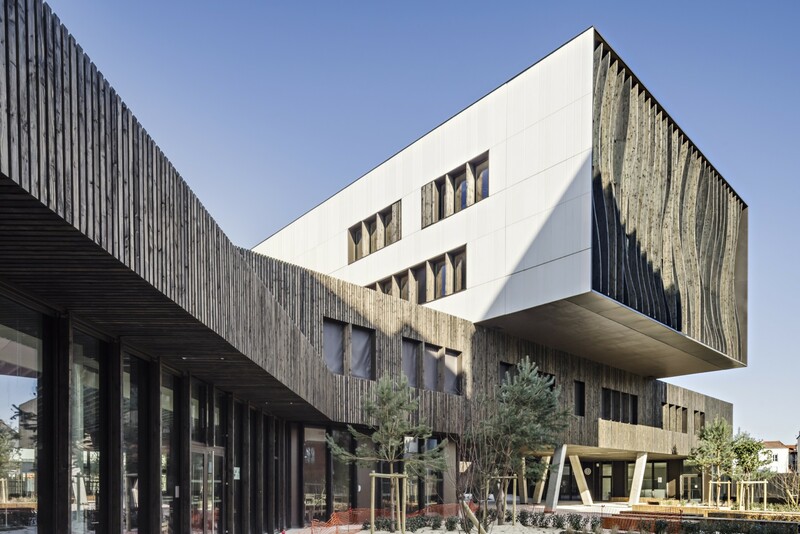 South of Saint Denis (France), in an urban development zone called Montjoie, architectural studio Brenac & Gonzalez & Associés designed a high-school. The La Plaine high-school represented an urban and architectural challenge for the architects, due to its size and to the programme carried out, that combines a high school, a student boarding house and other administrative and technical areas. The architects drew inspiration from a spiral for the spatial distribution and organisation of the volumes and their functions. It is not a chance if a spiral was used: this geometrical figure indeed has always been a symbol of movement and progress towards knowledge. The spiral, therefore, is the perfect metaphor for a school, a place devoted to learning and culture, a starting point for young people who are learning and looking for their own place inside the society. The functional scheme is also consistent with the intention of the architects to create a complex that was not closed or isolated from its reference urban context. On the contrary, they wanted it to be open to the city, its neighbourhood and its citizens. The complex is in a perfect position, on the corner between three important roads, one of which will be created shortly. The architects created visual connections with the urban context, building raised volumes. Thanks to these structures in bridge form, the architects could design new perspectives between the public and the private spaces, a visual connection between the forecourt, the courtyard and the interior gardens. The canteen connects the different functions and volumes, such as the high school, the boarding house, the offices and the technical rooms. The movement suggested by the spiral is also present in the façade. The architects designed a covering and solutions that recall ribbons in movement, passing imperceptibly from the exterior to the interior and vice versa. These variations are enhanced by the use of different materials. As regards the recreation areas, for instance, the façades facing the city are realised with white cement panels, while those facing the internal courtyard are covered with grey wooden panels that make the walls more three-dimensional.